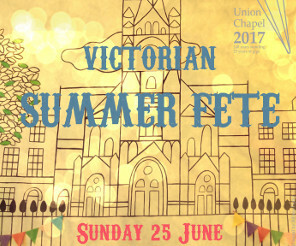 This Sunday 25th June (12 to 4pm) we will once again be at Union Chapel Summer Fete. As lots of the usual suspects will be away on a WI camping trip this weekend our numbers will be sadly depleted. We’ll have a stall selling biscuits and flapjacks and the like (no cake) so if you can help out with treats to sell and/or could help on the stall let us know! Hope to see lots of people there! Entry is free! 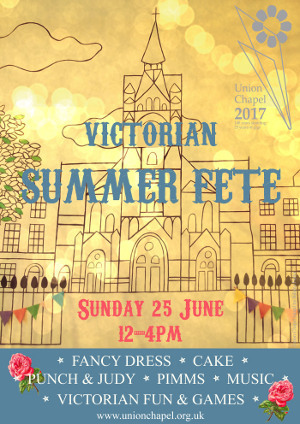 This year to celebrate the 140th anniversary of the building, the fete has a Victorian theme! There will live music, fancy dress, Punch & Judy and games of all sorts. There’ll be music from the folk tinged Endery’s Room, featuring an original Victorian pedal harmonium. A chance for those who haven’t come in fancy dress to try on some Victorian outfits. Not to mention authentic games of the era, arts & crafts and cake galore! Oh and just a spot of gin. For more information and other ways to get involved with the fete click here!